Hello, Hope your weekend is off to a great start! It’s time for a new challenge at Just Us Girls. 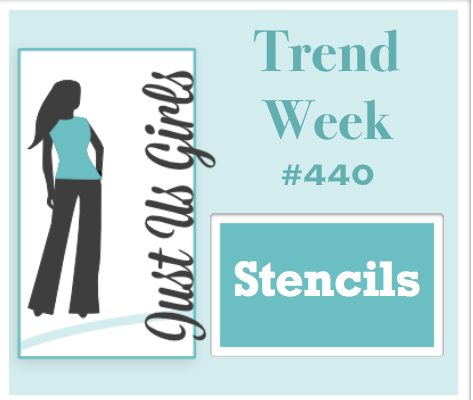 Angie has asked us this week to use stencils on our card and or project! Easy huh! Who doesn’t have a pile of stencils laying around? The stencil I chose for my card is the heart from Heidi Swapp. This card was made for my Hubster! He has been very patient with me over the past several months, as I have not been well, and I don’t know what I would do without him. He is a keeper for sure! I do not own this adorable otter from MFT, but when my good friend and fellow STB DT member Barb was down in Florida this past winter, she let me ink up this adorable set and take some images back home with me. Thanks Barbara!!! I used my oxide inks for the background, and a mixture of Copic and Prisma Colored pencils for the cute little otter. I am not quite sure how I feel about the clear Nuvo drops…I think I got carried away! Categories: Cards | Tags: Card making, Cards, love, my favorite things, oxide inks, rubber stamps, stamping, stencils | Permalink. Nancy! I am speechless! This card is just too adorable. The sentiment and the otter are so sweet centered in the stenciled heart. I love the Nuvo drops, not too many. Dave is lucky to have you and this card. Hugs for a healthier summer. A cute and adorable card and I love the way you designed this card. Fabulous stencil too! What a super sweet card! Love that heart and that little guy sitting in the middle is awesome! Great job!!! I love your card so much! And the Nuvo drops are just PERFECT!!! We’re about to embark on Day 2 of bike race officiating (and Day 14 of NOT being in my craftroom…eek! ), but popping in to let you know that your sweet little otter, tucked into the heart, is beyond adorable! Your husband will adore this, as do I! So sweet; so infused with love! Sounds like your both keepers for one another! I’m sorry you haven’t been well, Nancy, but it didn’t stop you from making this adorable card. The otter is so cute hugging his little heart, sitting inside a bigger stenciled heart. Awwww shucks! I’m not Kewl anymore?? : ( giggles. Nancy your card is almost as adorable as YOU! 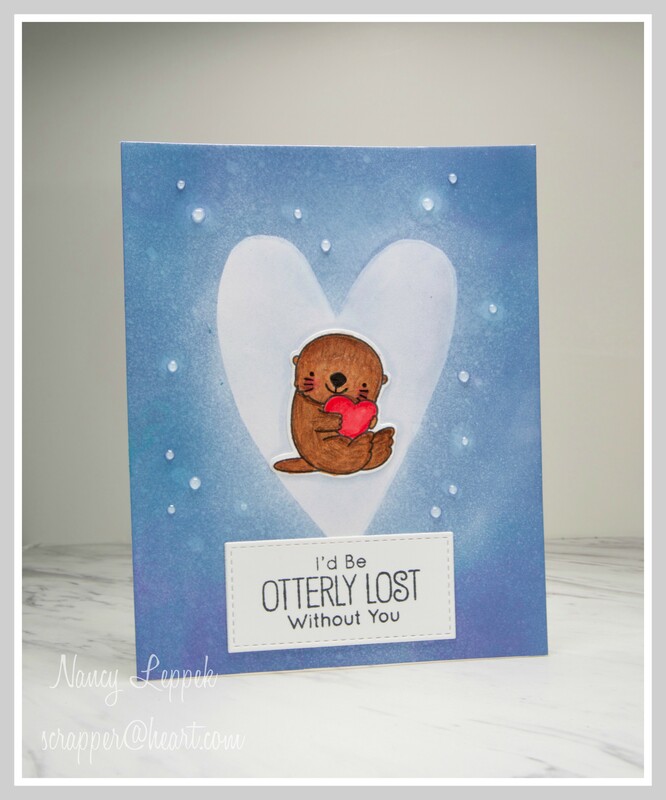 Blogland would be otterly lost without you my friend this is adorable in every way. This is just as cute as can be and so thoughtful of you to let your hubster know how much you appreciate him! That otter is adorable and love the stenciling. I think you Nuvo drops are perfect. I hope you are feeling better very soon! How cute is this guy in the middle of the fun stenciled heart! This is so cute. Love how you used the heart stencil to highlight that cute otter image.